Sorry there was no update yesterday; I think the travel exhaustion is setting in. Yesterday we went to the museum center where I went to the Rijksmuseum and Mom went to the Van Gogh museum. After we reuinited, I found out that she skipped the museum in favor of relaxing in the public gardens. I braved the long lines and crowds to see "The Night Watch", Amsterdam's favorite painting. They even have a statue re-enactment of it surrounding a large statue of Rembrandt in a park. Despite the crowds, it was worth it. The painting is huge, as the figures are life size, and if you fight your way through the hordes taking bad photos, you can stand there and look at it as long as you like. Surrounding it is a big hall of Dutch Masters, which I picked my way through. The realism of the still-lifes is astounding, but I could do without the landscapes and portraits. I breezed through several galleries to find the other Rembrandts—early works, sketches, and lithographs. They were charming, and it was less crowded so you could get inches away from them. (Necessary, as many of them are quite small.) 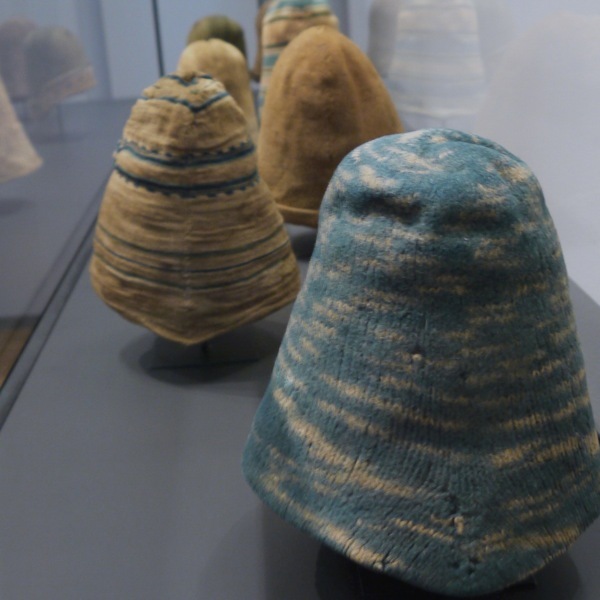 I also stumbled upon a display of knit caps recovered from a sunken whaling ship. Today we went to The Hague to see the Escher museum. It's a small museum, but worth the trip if you like his work as I do. We finished there about 3 pm and realized we had made a big miscalculation on the location of the second museum we wanted to see. It was too far way to walk to, and it closed at 5 pm. As we were debating if we should return to the train station to try to get a cab, Mom spotted one and in we hopped. Very lucky! The second museum was the city museum, but we went there to see the de Stijl pieces, especially the Mondrian. There was a large exhibit, but not as much Mondrian as we had hoped. Still, the building was worth the trip. It was an adventure trying to get back to the train station. No cabs at this smaller museum so we had to figure out how to take the tram. The one that the guidebook (and the web) said to take wasn't running in its usual manner because of road and building construction. A nice woman noticed our distress and explained that we had to take a different line & transfer. In the end, it all worked out, and a train to Amsterdam was leaving in 10 minutes when we got to the station. Sometimes when traveling you just have to make a guess and hope that you can recover if you head the wrong direction! We thought we might take a canal tour this evening, but most of them had stopped running by the time we returned to Amsterdam. So we will try tomorrow, before it rains. But we also have another museum to see, a market to visit, shopping to do, etc. whew! Time for bed, if the ducks (?) will stop hooting. I don't know what gets them so riled up at times! The canal has been quite active tonight, too. But as tired as I am, I suspect it won't stop me from sleeping. Photos: double-decker bike parking at the train station in Haarlem, knit whaling caps, Gemeentemuseum in Den Haag, de Stijl tile in the Gemeentemuseum.